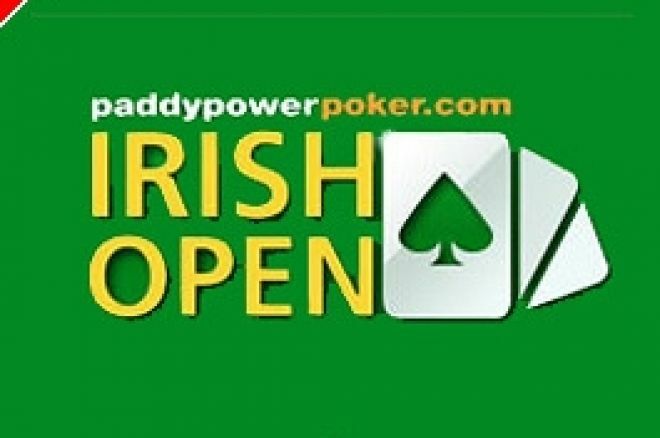 The Paddy Power Poker Irish Open finally reached an exciting conclusion in the early hours of this morning, in deepest Dublin, with victory achieved after a classic "coin toss" showdown between the winner, Vincent Melinn, and runner-up, Ian Woodley. The Royal Dublin Society was the venue for the six-handed final, televised and broadcast live by the cameras of Sky Sports, after 339 initial entrants to this &euro;3,000 buy-in event were whittled down over three gruelling days at Jurys Ballsbridge Hotel. Seat 6: Brendan Ruane (693,000) - Irish "pub player"
Having battled through in a conventional tournament poker room, the final six were removed from the familiar environment into the glare of the TV arc lights and a vociferous live audience. Would it affect their play? The next several hours certainly revealed plenty of erratic decisions but whether or not this was down to the pressures of live play, it was hard to gauge! The blinds had been reset to 8,000/16,000 with 1,000 antes for the final table so, with 3,400,000 chips in play, there would be no need for impatient play. The exception here was Paul Daly, the eldest here at 51 years of age and an Irish Open finalist in the 1980's, who was nursing a miniscule stack of chips and was in desperate need of at least two double ups. He attempted the first with JT offsuit and received a compulsory call from Ian Woodley in the big blind with T7 suited. The ideal cards had fallen for Daly and he increased his count to 120,000. That was the pinnacle for Daly as he exited soon after when ahead in another showdown, his A2 suited failing to stand up to Brendan Ruane's QJ suited which found a Q on the flop. 21-years-old Jon Wong from London was demonstrating some early class with a 62 offsuit bluff to take a pot, and it soon became clear that this was someone capable of being in contention if he could achieve a double up. He had already served notice by taking 4th place in one of the supporting tournaments here, the &euro;400 No Limit Hold'em Rebuy tournament, winning a purse of &euro;9,875. Vincent Melinn was getting busy early on with raises and re-raises, aided by several good hands but also a willingness to use his stack to take command of the table. He had the two smallest stacks to his left so they were sitting ducks on his button and he was meeting little resistance in the face of the steepening payout structure. The fifth-placed finisher would take away &euro;60,000, the fourth &euro;70,000, the third &euro;100,000, runner-up &euro;180,000 and the winner &euro;350,000. Melinn was also mixing up his play by calling as well as raising. Although this lost him some advantages in specific pots, it also left his opponents unsure of what they faced. Conor Smyth suffered a hit to his depreciating pile of chips when his 99 saw a flop of 25Q (with two diamonds showing). Smyth proceeded to call a small bet from Melinn on both the flop and the turn of Qs. Smyth must have considered there was a good chance he was ahead both times but did not have the heart to raise to find out for sure. In the end he folded to another small bet on the end when a call for value would have seemed most sensible. However, it so happened that Melinn did possess AQ. This pattern of passive calling when a raise seemed the better bet continued throughout the tournament by most of the players. Only Wong seemed to have a constant game at this point but he was not finding the cards and was being re-raised when he didn't want to be! By now, Smyth was close to the felt and Wong also needed air in his balloon. Smyth decided to go for it with 53 offsuit having earlier folded QJ suited to a Melinn raise. Ruane dealt the fatal blow by calling with AK suited. Smyth took away &euro;70,000. Now Wong would need to get busy. He picked up chips off Melinn when re-raising him with 99. Melinn folded his KT offsuit. Wong then discovered that poker can be a cruel mistress. Melinn raised to 80,000 in the small blind with A9 offsuit. Wong contemplated his future with AT offsuit and finally re-raised all-in. Melinn happily called. If Wong could see through this favourable scenario, he would be up with the leaders and a serious threat to them. The flop and turn of 8K4J looked lovely but one of the remaining 9's hit the river and Wong was history. It seemed that Melinn's name was mysteriously etching itself on the trophy. We were now three-handed and the chips soon became even after Ruane came over the top of a Melinn re-raise. Ruane, as was a feature of the tournament, slow-played AK and Melinn's 28 o/s saw a flop of 2T4 which Melinn decided to exploit with a 300,000 re-raise. Ruane put his tournament on the line with an all-in raise holding ace high! Melinn almost certainly would have called with top pair but a pair of deuces was not enough. Play became cagey with so much room in which to play. Woodley, who has an impressive record playing in England, was consistent and methodical but also conservative, choosing to call and limp in frequently, and taking his time with decisions. In one hand both Woodley and Melinn flopped pairs but the pot went to Ruane who ran a tiny bluff on the end with 62 offsuit! No player came out of that hand with distinction but the money at stake almost certainly provided the excuse, as the difference between third and first was &euro;250,000. Once again, Melinn forged ahead, finding AA and taking a moderate pot. He then made further progress after putting Ruane to the test by re-raising all-in Ruane's check-raise on a flop of 953. Melinn executed this with 94 offsuit. Ruane was in agony as he held Q9 offsuit but concluded that the re-raise spelled trouble. Ruane's chance had gone. Also gone it seemed was his composure. On the button, Ruane raised to 80,000 with KQ suited in hearts. Melinn called with 44 and Woodley with J8 offsuit. The flop of 4s2c9c gave Melinn a set. After a check from Woodley, Ruane bluffed with 200,000 which Melinn batted back with interest - All-in! Presumably the two clubs on the flop made his mind up not to slow-play the set and it seemed that Ruane must fold his king high. Not when you are tired and desperate! Ruane's first bet had in any case reduced his stack to a poor third place so he must have figured that the pot ratio and the possibility that Melinn might be on a bluff steal himself, coupled with having two overcards, were good enough reasons to take a big gamble. It was lost albeit the turn card of a 10 allowed for a gutshot draw on the river. It didn't come and Melinn was in business with a 3:1 chip lead over his heads-up opponent Ian Woodley. Woodley decided to attack and raised with Q8 offsuit only to be re-raised. Woodley called all-in immediately figuring to have live cards. Melinn was in fair shape with A3 offsuit but only a moderate favourite. The flop delivered a jab and right hook to Melinn, with 8Q7 producing 2-pair for the Englishman. The turn added an uppercut to the flurry of blows by making a full house. Woodley was back level and everything seemed set for a collision of two strong hands. The winner was sitting in the cupped hands of the Poker Gods now, and deliverance arrived when the money went in with Melinn holding 77 and Woodley AJ suited. Flop 6T2, turn T, river 4. It was all over and Vincent Melinn let out his emotions in victory. The Irish Open trophy comes back to Ireland after a spell in Lancashire in the arms of "Burnley" John Falconer. Well done to all who participated and made the money, and plaudits to Paddy Power Poker for making it happen. Roll on next Easter.